Raspberry Port Trifle | What about this? The choices are endless when it comes to choosing a dessert for Valentine’s Day. But choosing the perfect dessert depends on exactly who your special Valentine is. 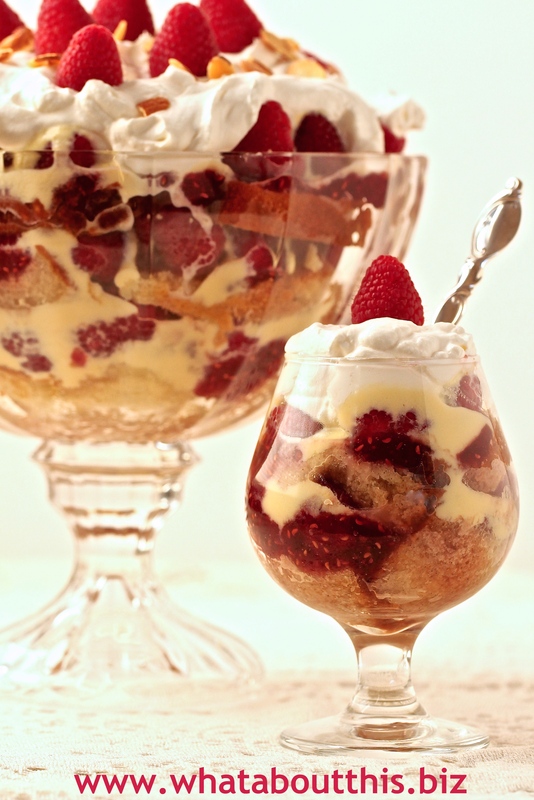 Like my Valentine, a trifle is never boring, very versatile, and always indulgent. Come February 14th, my Valentine will be served a trifle that is composed of layers of fresh raspberries, vanilla cake, good tawny port, raspberry jam, and homemade crème anglaise. Make one large trifle or several individual ones. Make a haphazardly messy trifle like mine or a structurally engineered one, but any dessert as rich as a trifle deserves to be topped off with fresh whipped cream! Happy Valentine’s Day! 1. Heat the milk in a heavy saucepan over medium heat until a skin forms on its surface, just before it comes to a simmer. 2. Meanwhile, whisk the egg yolks with the sugar, vanilla, and salt until well blended and slightly thickened. 3. While whisking continuously, slowly pour about 1 cup pf the hot milk into the egg yolk mixture. Then, still whisking continuously, slowly pour the egg yolk mixture back into the saucepan with the remaining hot milk. 5. Immediately remove the custard from the heat and pour it through a fine-mesh sieve into a 2-qt bowl. Cover with plastic wrap, placing it directly on the surface so the custard doesn’t form a skin. Let the custard cool to room temperature. 1. Slice the cake into 1/2- to 3/4-inch thick pieces. Arrange one-third of the slices on the bottom of the trifle bowl, pressing the cake to fill the bottom. 2. Pour 1/4 cup of the port evenly over the cake, then spread 1/3 cup of the jam over the cake. 3. Cover with a layer of raspberries, using about 1-1/3 cups, then pour 3/4 cup of custard over the berries. 4. Repeat the entire process two more times. 5. Cover the surface of the trifle with plastic wrap and refrigerate for at least 24 hours and up to two days. 1. Well in advance of serving, put the whipping cream in a bowl in the refrigerator, along with a whisk. 2. When you’re ready to serve, whip the cream with the sugar and vanilla until it holds soft peaks, 5 to 7 minutes. 3. Pile the whipped cream atop the trifle and garnish with the fresh fruit and toasted nuts. 1. For the cake, I bought a box of Trader Joe’s Vanilla Cake & Baking Mix and baked it the day before assembling the trifle. 2. Also, to make it easier, I purchased Trader Joe’s Sliced Honey Roasted Almonds. These are ready to use, no toasting involved. Plus, they will be great in my Homemade Granola Bars. 3. As seen in the photo, you can make one large trifle or several individual ones. I used brandy snifters for the small trifles. 4. Keep in mind that trifles need to sit for awhile. This trifle can be made up to 2 days ahead.